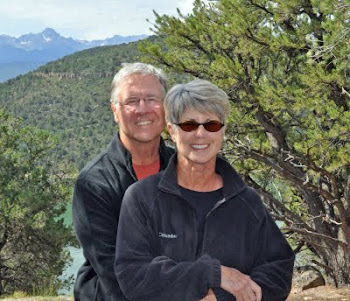 Find us on Google+ Rick and JoAnne's RV Travels: Do you ever get bored? and we’ve made some new friends. Part of our family has come for a short visit, and we are forever grateful that some of our “old friends” come to visit as well. Really and truly, never a dull moment! From helping campers, fixing problems, giving information, sharing experiences – and yes, “war stories” from the campgrounds! Last Sunday, we hosted a BBQ for the Rangers who were on duty, and fellow camp hosts from this side (the west side) of the park. The west side camp hosts all go the breakfast every Sunday morning at West Glacier Restaurant, in West Glacier – we go to dinner with other couples, and have cocktails after work! In between all of this, we blog, email, talk to, and FaceTime with the grandkids. I of course do genealogy, Rick works, and we also have hobbies we enjoy – plus we occasionally have to do some grocery shopping, and the ever growing laundry! Wild Flowers, Wild flowers everywhere!